Six years of blogging on lobstersquad and this is the first time lobsters make an appearance. At last. Scotland has many shortcomings in the grocery shopping department. In Aberdeen we have no market, so I miss out on all the banter, the great produce, the old ladies at the queue who can tell you how to cook anything. We have no greengrocers, so I have to buy all my vegetables and fruits encased in plastic, in a supermarket with no soul. I haven´t eaten a tomato since I arrived, two years ago. But on the plus side, we have parsnips, and kale, and raspberries and real strawberries, and new potatoes, and crisp apples, and sausages and gammon joints, and Marmite and hot mango sauce and chapati flour and gorgeous thick yogurt and creamy milk and cream so rich that your arteries clog just from looking at it. Then on top of all that there are the shellfish. In Spain they are the most highly prized, expensive, luxurious articles you can buy. Here, not so much. Boiled crabs cost about the same as smoked mackerel, far less than sole or monkfish or that ethically unsound tuna. And you can buy the crab meat, neatly picked, in a box. As for lobsters, a fat whopping thing at the fishmonger will set you back about the price of a plate of nachos and two beers in a pub. In other words, a bargain. So when we have guests from Spain, we like to order one of these beauties for a showy first course. They are already boiled, so there are no Annie Hall antics to suffer. All we need is a bowl of mayonnaise and another one of chopped herbs and pickles, so people can mix and match their tartare as they like. Wine, or beer, bread, salad, and away we go. When we´ve finished, I put the lobster shells in the pressure cooker with an onion, a stick of celery and a carrot, cover it with water and give them 30 minutes under pressure. In a normal pot I guess that´s 90 minutes, but you can stop when you think it´s ready.The stock is thin and malevolently red, tastes strongly of lobster, and makes a next day risotto or fish soup a thing of beauty. Of course there are never any bits of lobster meat left (cookbook writers, what planet do you live on?) but you can throw in frozen prawns and white fish and it will be wonderful. Posted by lobstersquad at 11:28 a. m.
Leftover lobster meat? Is that a possibility? Great idea about making that stock. 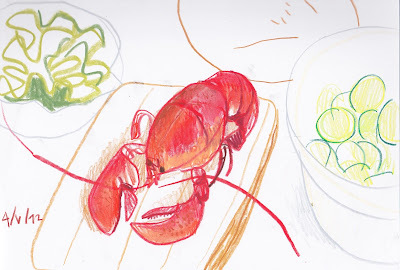 How long do you think it might take for a lobster stock to cook in a normal pot instead of the pressure cooker? It's a shame you don't have any markets in Aberdeen. It's always a thrill to be among the fresh produce and the people who sell them. Magda: I often see that written about lobster meat, go figure. I changed the post to include the timing for a normal pot, thanks for that. 90 minutes.